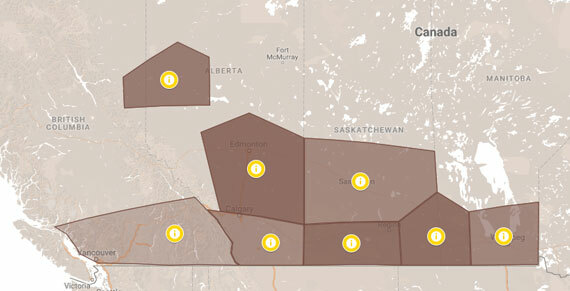 It’s May long weekend and you’re 60% finished seeding. You roll out of bed with a smile on your face, feeling great as you walk to the bedroom window. You flip the blinds open to look outside… and to your horror, there are six inches of snow on the ground – despite the weather report calling for light showers!!! Your stress level goes through the roof. Like people, plants are vulnerable to a wide variety of everyday stressors. Because we care for the health of your crops (and your health too), we’d like to share the following stress reduction strategies. 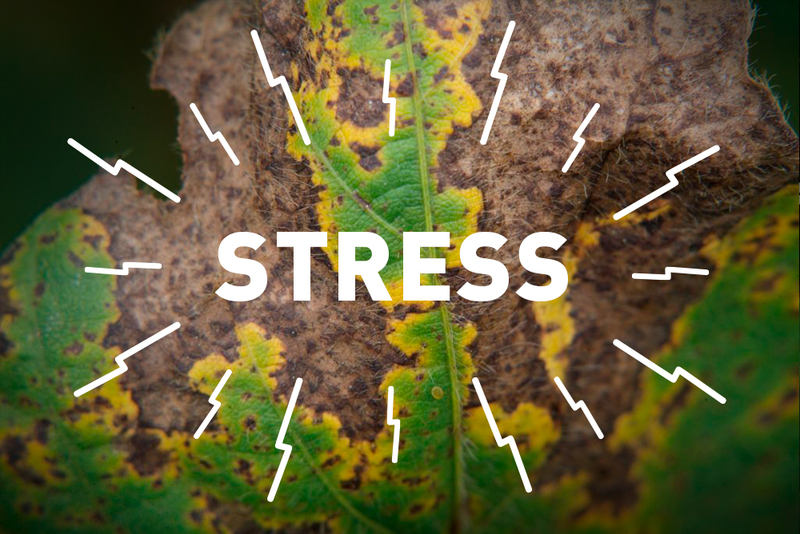 But first, let’s compare stress in plants and humans. With people, we typically talk about stress in the context of the day-to-day pressure we feel in our lives, which can cause us to feel worried or agitated. In plants, stress is more about the physical effects of outside forces on the plant. Plants face two main types of stress: Biotic Stress and Abiotic Stress. Biotic Stress is damage caused to the plant by other living organisms (such as insects, bacteria, fungi, parasites and weeds). Abiotic stress is caused by other environmental factors (eg. high or low temperatures, drought or flooding, herbicide stress, hail, frost, lack of nutrients, poor soil conditions, etc.). Both forms of stress can have a profound impact on plant development at different stages and ultimately set back yield. It is important that plants receive a healthy diet of essential macro nutrients and micronutrients, administered at key points of the plant’s growth cycle. For example, ample Phosphorus is critical to the development of seedlings, energy production and the establishment of a healthy and robust root system. Take the time to learn which nutrients are important at which growth stages and supplement the plant’s diet with a sound fertility strategy. There are several ways you can create a warm, safe and welcoming environment for your plants. Following recommended seeding practices and fertilizer placement recommendations will improve seed viability. Using a nutritional seed dressing can protect the seed against cracking and improve stand establishment while providing a timely boost of nutrients. Staying on top of weeds, insects and other biotic stressors is a must. Yet even the selective herbicides that reduce weed stress can cause another kind of stress in plants by temporarily shutting down photosynthesis. This is known as herbicide stress. It occurs as the plant works to metabolize the herbicide – redirecting energy from normal plant functions at a key growth stage and setting back development. In extreme cases, herbicide stress is visible, but in most situations, there are no outward signs. Fortunately, there are now solutions that work at the plant’s molecular level to prevent this temporary setback by inhibiting the production of ethylene in the plant – which reduces the impact of herbicide stress on the crop. Finally, taking appropriate steps to maintain soil health (like monitoring pH and mineral imbalances) should be part of an overall management practice. 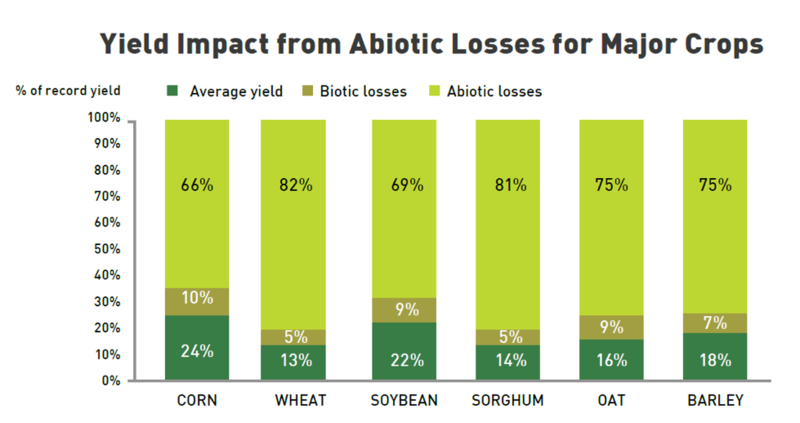 This chart shows the impact of abiotic stress on yield potential. Source: Biochemistry and Molecular Biology of Plants, Buchanan, Gruissem, Jones, American Society of Plant Physiologists, 2000. Get your seed off to the best possible start! For agricultural crops, there is a growing category of plant enhancement technologies developed in the laboratory to help plants deal with stress – including cold temperatures, drought or wet conditions. Containing nutrients and bioactive compounds, these products stimulate desirable responses while downregulating undesirable responses at the plant’s molecular level. For example, these products may activate functions in the plant to increase water use efficiency; trigger earlier germination; promote enhanced root growth and much more. Taking advantage of this innovative technology early in the season will help protect plants against stress when they are at their most vulnerable. Getting to the bottom of plant stress starts by literally focusing on the bottom part of the plant. Plants with a strong and healthy root system are better able to access the water and nutrients necessary to stand up to stressful situations. There are several seed primers and foliar nutrients that enhance root development by inducing the production of Indole Butyric Acid (IBA) in the plant. Using biological inoculants containing beneficial microorganisms is another. Mycorrhizae, for example, helps extend the plant’s root network allowing it to reach deeper into the surrounding soil to gather vital water and nutrients required to ward off drought and stress. Growers can help their plants deal with stress by following best management practices, scouting the fields for pests and signs of disease, and conducting regular soil and tissue samples. If something doesn’t seem quite right about your crops, it is always a good idea to consult with a local agronomist. Biotic and abiotic stress can have a real and lasting effect on plants throughout the growing season. Getting the plants off to a strong start and ensuring continued care and support as the plant grows will improve your ability to achieve a healthy harvest. By equipping plants to better deal with the challenges they will face in the fields, and giving them every advantage to thrive, plant stress will be one less thing you need to fret about as a grower. 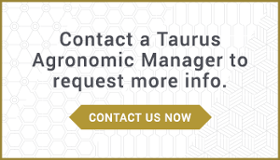 Looking to reduce herbicide stress?